Hi Denny, I read somewhere that TV antennas must be somewhat ugly to work well. I think I tried all the cute little antennas out there. I'm 55 miles from the main transmitters. I tried the Lava, Marathon, 1byone and a few others and none could hold a consistent signal on all channels. As a last ditch effort I tried your EZ HDTV antenna with the LNA 200 preamplifier and 3 months later couldn't be happier. Let me start by saying I know nothing about antennas, I have always had cable and was getting fed up with the price increases. I looked around on the Internet and decided to order your ez-hd antenna. When it came in I went to Walmart and bought a Clearstream 2V with the idea that I would let the best antenna win. I live in a condo at the Beach in Virginia Beach and the only place I could get away with putting an antenna was in a corner of my second floor balcony that faces west (fortunately the broadcast towers are due west , between 28 and 30 miles from me. I tried them both in same spot, through the same cable and your ez-hd out performed the clearstream in every way, Stronger signal, more channels, and better picture. I took the $100.00 Clearstream 2V back that same day. Next day I canceled Cox Cable, and two weeks later I couldn't be happier. 27 channels and no cable bill. Thanks to you and your great product. Just a quick note to say thanks for a great product. We installed your EZ HD antenna on a home in Gulfport Fl. Installation was easy and the reception is great. With the first scan for stations we received 47 HD channels. Signal strength is high and picture quality is amazing! The antenna is mounted 15 feet above the ground on a pole secured to the eves. Bravo! Success on the EZ HD HDTV antenna install! I picked up 9 channels without the AP 8700 powered and 23 with it on. Thanks for a great products and your suggestions and help. The antenna is pointed 5 degrees northeast toward Little Rock Arkansas. TV station antennas are roughly 40 miles away. Just wanna give you a shout out for the direction you provided on the TV antenna selection. I am off of cable TV and couldn't be happier. I get 37 channels in excellent reception split out to all my TV's in the house (I have 7 of them). The EZ-HD antenna combined with the HDA-200 works great and the quality of the picture on all tv's is excellent. Again, thank you for your direction and honesty. I tell everyone about your site and how the site and you helped me before I even bought the antenna. Dear Denny's, Antenna and could not be more satisfied. Shipping was prompt, the installation was simple and the results are GOODBYE CABLE! All of my main stations come in as well as many new stations with better pictures than I had been getting on digital cable. Do I need a 4K TV antenna? Hi Denny, don't know if you need another EZ HDTV antenna, Clearstream 2V antenna report but here it is. I also live in a condo. I'm in Melbourne, FL. and saw Lloyds report from Virginia Beach. My Clearstream 2V was mounted in my attic. My stations are from Orlando at a distance of about 45 miles. With the Clearstream 2V I couldn't get NBC 2.1 at all and several other channels would go in and out. I decided to try the EZ HD and when it arrived I installed it on the same mount in the exact same location as the Clearstream 2V. I changed nothing but the antenna. Once the EZ HD was in place I scanned for channels and channel 2.1 came in with a signal strength of 78% and all other channels increased by at least 15%. Since the installation of the EZ HD 2 weeks ago the reception has been beautiful. I got my EZ HD HDTV antenna installed in my attic. I put the HDA 100 amplifier in my basement. I get 48 stations -- Indianapolis, Bloomington, Muncie, Kokomo, and Marion. All stations are fantastic color, clarity, etc. far better than Comcast. Denny.....Just wanted to let you know how well your EZ HD antenna has worked for me in Reno, Nv.. Didn't know what to expect as I don't have line of sight ( ridge top, 2 story house next door, dense trees) to the primary transmitters 23.5 miles away. I first tried a temporary roof install (not the best location, other than being outside) and was pleasantly surprised.......got 20 channels and all with great picture quality ( the lowest signal strength was 89, with most coming in at 98). With those great results, I thought I would try it in the attic. Again, the results were identical with most of the readings at 98 with the lowest still around 88-89, no signal deterioration whatsoever. Still can't believe how well this antenna performs. Thank you again for your help. Jim A. Starting from scratch? 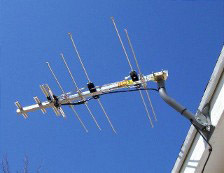 Check out the EZ HD antenna installation kit. Includes: Antenna, antenna mount, coax cable, cable fasteners, lag screws and sealing pads. Just wanted to say thanks a ton for the advice and help w/this issue. I've just received my antenna, yanked it out of the box (albeit very slowly and softly), ran a few wires and set it on a box in the attic facing s/SW and boom i get everything. super clear reception, great quality. Couldn't be happier. attached it to a roof rafter in the attic. Nice job! Want to connect multiple TVs to the antenna? When I emailed you explaining that I wanted to receive the digital station from both Baltimore and Washington DC and you suggest two EZ-HD antennas one pointing at each location I must say I had my doubts. Well the system is in and working perfectly and I can't thank you enough. Your EZ-HDTV antenna not only works great but is very well built and the fact that it's made in the USA is just icing on the cake. I just put up the EZ HD TV antenna today 32311. Getting 14 channels 85% on FOX - 100% on the rest no compass just pointed NE Impressed. I bought the EZ HD HDTV antenna. Figured it had to be better than rabbit ears. I set it on my roof to see and went from 7 channels to 27! I was flabbergasted. And it's not even mounted yet! Great antenna for a great price! We are very pleased with our EZ HD antenna. Last Friday we tried to get on our roof and it is too steep we decided to try it in the attic. After an initial test we installed a pole in the rafters and our reception couldn't be better. We are receiving every channel possible and the picture is great. We had to try a few different positions and re scan but in no time all channels looked beautiful. ANT THE REALLY GOOD NEWS... the screen is filled and it is in HD which I do like. This Sunday when we watched the super bowl on FOX it was such a different experience from the severely pillared boxed non HDTV former version fron cable. Thank you for your help I hope to send you some business. The EZ HD antenna works perfectly and as advertised. A great product and easily installed. Thanks again, Paul H. Tampa, FL. I just wanted to say thanks for the EZ HDTV Antenna(s) I have purchased from you. They are better than advertised. Reading your section on who should purchase this antenna and limitations to expect I was skeptical that my installations would work. I was prepared to install and if it did not work, write off the cost and order the larger version. Both (my home and my fathers) installations are in one story attics surrounded by trees 54 miles from the main TV stations we want (ABC, CBS). I followed your instructions and recommendations of what to purchase with the exception of the booster box. I had two that I have owned forever. I could not be happier with the number of channels available (we receive all be but 1 that is within range). The quality of the picture is sharp and HD. Thank you Denny, we no longer pay high cable/satellite bills and do not worry about the antenna when the occasional hurricane passes through here. I would also like to compliment your staff. My father made a mistake on his order and the staff caught it, called me and resolved the problem. Oh and thank you for the quick shipping. You guys are great. I have installed the EZ HD HDTV antenna and what a picture I receive. I am about 50 miles from the transmitting antennas and my signal strength ranges from 84 to 96 on all channels I receive. I do not have any picture fade as of yet and we had a 30 knot wind on Saturday out of the north. I installed our new EZ HD antenna with the HDA 100. Installed as you instructed and the results were nothing short of AMAZING. We now get 39 channels with crystal clear picture. Thank you without your help I would have had to cave in to cable TV. I will be sure to promote you and your company every chance I get.. I've been researching antennas for weeks in the hope of dropping cox cable company due to large price increases here in Scottsdale. Our main transmitting tower is 28 miles away so I figured I'd give it a shot. I wanted to try an indoor attic antenna (I know the restrictions with a stucco house) due to HOA hassles in McDowell Mountain Ranch community. I was going to get one of those little "high tech" antennas but saw they were very short and had too much plastic to take our 115 degree + roof top temps here--nothing made of plastic ever holds up. Then I came across your wonderful site and your solid engineering knowledge convinced me to get the proper sized antenna for the minimum wavelengths required for good RF reception. Plus the fact your HDTV antenna was all aluminum and looked well built. I was getting only 3 HDchannels with a set top antenna with power levels in the yellow 50-55 range and some pixelation/freezing. I put the EZ HD with mount in the peak of the attic and placed in high up at the peak of the roof facing out 18" off the right side of the metal ventilation grill opening and aligned it with my trusty compass and voila. I got 70-71 green levels and a ton of perfect HD channels (15+) which looked much better than cable. Then I stopped by Walmart and picked up a Phillips 18DB amplifier just to see if it would help boost the attic signal and boom--all levels are now at 82-85 range and I get 23 beautiful HD channels and another 30+ regular clear stations. Thank you for your honest and straight shooting site and your return guarantee is the best around-you obviously stand behind your products. I added on 2 more HD TV sets through a splitter and I still get strong signals and no pixelating/freezing. My wife is thrilled and is dumping cable today saving us $660.00 a year. Now that feels really great ! I have to tell you just how impressed I am with your EZ antenna. The reception is great to say the least but what I am most impressed with is quality of construction. It's second to none! I appreciate that. I don't feel like I got ripped off. Made in America!!! I bought the EZ-HD HDTV antenna. It was as easy as antennas are to install and performs exactly the way you described. Located in Stockton, at roof height, I am able to receive 14 channels, mostly out of Sacramento and one out of San Jose. Aiming the antenna differently may find more. It would be great to see San Francisco channels, but that may not be possible. I am pleased with your antenna. I just wanted to thank you for selling a quality antenna that works as advertised, the EZ-HD. I have been struggling for over a year trying to pull in one particular station on a VHF frequency (WFAA in Dallas, TX), and after investing in three name brand antennas that failed to get the job done, I finally had success with your EZ-HD. Not only does it pick up our one and only VHF station, it picks up all of our UHF stations with 87+ signal strength. Now I can actually set back and watch television rather than climb into the attic (again) and re-aim my antenna all day. Thank you for selling the VERY best HDTV antenna for the Dallas/Fort Worth area. Just wanted to say THANKS! I live in a rural area 66 miles from the Houston, Tx transmitters. For the past 16 years I've been a cheap skate and only had rabbit ears on top of our TV's. That would give us about 3 OK channels and about 2 sometime channels. The rabbit ears would not however pickup the HD signal with the converter box. I got one of your HD-EZ antennas along with a pre-amp, installed it, and got 91 on the strength meter outside and about 82-86 with it inside the attic. I ended up mounting it inside the attic and now have 27 crystal clear channels. This is cool - and honestly two weeks ago I was cursing the whole HD conversion thing because it didn't work through the rabbit ears. Thanks again. I ordered an EZ-HD HDTV antenna from you recently, and I can't believe how great it works! I was replacing a cheap Phillips amplified antenna, and the signal with the EZ-HD (without an amp) is so much better I can't hardly believe it. Thanks for a great product! I mounted it on the back side eave of my home, pointed it northeast as you suggested and get every station available. I'm not saying it works any better then my neighbors antenna but just as good. He paid $650, I paid $89.00, his is 12 feet long mine is less then 3 feet. I'll be sure to tell everyone that's interested in over the air HDTV about your antenna. The picture quality is better then the cable we just had turned off. The antenna system cost $17 more then one cable bill. Your welcome to put this in your website, I don't even mind if you use my last name. I laid the EZ-HD HDTV antenna on the roof last night just to see how things would work and I got 28 channels of HD clear as a bell, without the amp. Dragged it into the attic, removed the old antenna, and hooked the new one to the existing mast, scanned for channels and got 36 channels of HD very clear, still without the amp. Tonight I plan to install the amp and finish up the routing of the cable. I need to pick up 2 short pieces of coax, one from the amp transformer to the back of the TV, one from the amp on the mast to the antenna. I am curious to see how much more signal the amp provides, without the amp I'm getting about 75% or better on the channel power scale my HDTV converter shows. I just wanted to thank you. I have installed both the EZ-HD TV antenna & the AP 8780 preamplifier. I mounted both on an the J pole on the east side of the house where I have the 61.5 dish at the top and the EZ-HD just below the dish pointed SSW. I'm getting all the majors and a bunch of other stations from both the Miami & West Palm Beach markets. So far I only have the Dish Network receiver hooked up, but all the signals are in the mid 80s or higher. Thanks so much for your help. The EZ-HD antenna is up and it works just great. We are able to get all of the local channels in digital format, but have a little trouble with channel 41 on 1 tv( non-digital set) but it works on the HDTV set. That comes from St Cloud MN. so it is picking up the signal off the back side of the antenna. That is not a problem anyway because we never watch that station. Denny; Thank you for all your help and guidance in the selection of my antenna. It is rare to find someone as honest and willing to help as you. Sorry that I didn't respond to your question on me needing a crimping tool. Once I got my head out of my pocket (again) I remembered my neighbor has a tele-communications business so the crimper and stripping tool was no problem. I have the new TV set hooked to the new EZ-HD TV antenna and am amazed at the reception. The set has a signal strength indicator in the menu and it is within 1 or 2 points of maximum on all local stations. Speaking of stations I now receive 29 local stations, had no idea that there were this many available. I can almost get channel 9 out of Windsor, Canada. Being as I receive the locals so well I will experiment with rotating the antenna more towards the North a little at a time and see what happens to Channel 9. All in all, I am extremely pleased with the antenna you suggested, with the quality of the merchandise you sent me and most importantly, with your unfailing courtesy and help. Thank you very much! The EZ-HD TV antenna will also work great at your mother's location. The narrower end of the antenna should be pointed West/Southwest as you know at 254-56 degrees. Along with the antenna I suggest the HDA 100 amplifier installed on the coax cable down lead just ahead of the signal splitter on the antenna side. This will insure that the signal will remain strong as it's divided by the splitter and it travels the cable to the TV's. I'm happy to hear the EZ-HD is performing well for you. I'm certain that it will do the same for your mother at her location. Thanks for providing such a thorough and informative web site on TV antennas. I live in Culver City which is a suburb of Los Angeles, and I was pleasantly surprised to see that you have a link to Los Angeles on your home page. I clicked it and read about your EZ-HD HDTV antenna. To be honest, I was a bit skeptical that an antenna that small could provide good reception. But since you have a money back guarantee I decided to give it a try. Installing that compact antenna on my mast was so much easier than the old one which is more than twice as large as the EZ-HD. Of course the real test is how well it received the signals from Mt. Wilson which is about 25 miles northeast of my house. I currently watch digital TV only, either through an HDTV ATSC tuner or a TV converter box. All of the channels in my area come through strong and clear and I'm not using any type of signal amplifier. The EZ-HD TV antenna may not work for everyone, but for my purposes this antenna is just perfect. I am so glad that I Googled antennas and found your site! Thanks for making the EZ-HD antenna available to us out here in LA. I'm happy with the performance of the hdtv antenna! Once I pointed it East as you suggested, I get zero jitters or dropouts from the local stations.